The Principal of Spruce Avenue Elementary School booked some guy called The Sultan of Success as a guest speaker. What was she thinking? And what is that sticker on her lapel? Good thing the Bible team is always vigilant for threats. Or are they? "It's MY money, and you can't tell me what to do with it!" Uh-oh, sounds like somebody is having second thoughts about paying their pledge to the Youth Group Fundraiser-and Lila is a member of the group! 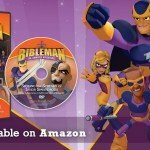 Is it already too late for Bibleman to save the day?! In this exciting conclusion - will Lila learn what commitment is all about, or will the Duchess in disguise take control with the power of GreeDust? Great for Kids ages 4 to 8.